Gone are the days when a simple infographic would cut the mustard. Today’s content marketers have to be agile, ready to take on everything from photo editing, to video editing, to creating memes guaranteed to go viral. Considering that many content marketers aren’t designers (or even former film majors) — that’s a considerable challenge. I’ve compiled my favorite tools that make visual content marketing easy for everyone, in nearly every medium. No expertise required. But wait — there’s more. 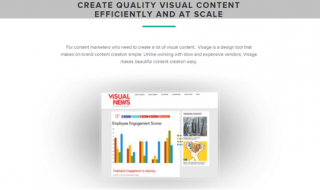 Creating visual content is only half the battle for marketers — I get that! So at the end of this post is a list of 10 Places to Share Your Designs That Will Bring You Way More Traffic Than Twitter or Facebook. Picmonkey is a free, web-based photo editor and graphic design tool with a surprising number of ever-changing fonts, trendy color schemes and fun designs to choose from. 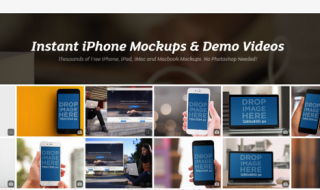 Placeit makes it easy to generate product mockups without Photoshop, and costs far less (one download costs $8, and monthly plans start from $12). 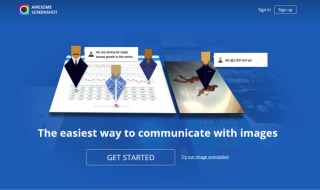 Visage makes it easy to bring great design to data by making it simple to create charts and graphs, and visually design them with colors, fonts, clipart and high-res image backgrounds. You can also use it to super-impose words on background images (many of which are included in the freemium version), or to create infographics. Unsplash — Adds 10 new royalty-free photos every 10 days, best for breathtaking landscapes, cityscapes and still-lives. 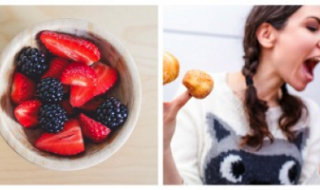 Picjumbo — High-res photos, no attribution required for almost all images, best for food pictures. Gratisography — Quirky, fun, provocative images by Ryan McGuire. NewOldStock — A random assortment of vintage photos ranging from the Sphinx to the Rolling Stones, and everything in between. Awesome Screenshot, available on Mozilla, Chrome and Safari, allows you to take screenshots of whole pages or parts of pages and annotate them with shapes — exceptionally useful for critiquing pages and images. 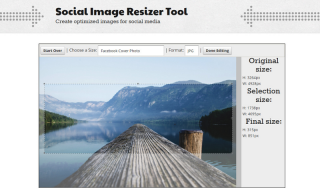 Social Image Resizer Tool makes it extremely easy to resize your images according to where you want to use them. Just upload your image and choose where it’s going — no need to know the pixel count. Dissolve has HD quality, royalty-free stock footage available for commercial use, making it easy to create a jaw-dropping video. Footage isn’t free, so expect to pay a few hundred for a 10–20 second clip. 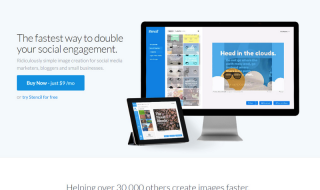 Stencil is a Chrome extension that lets you quickly put words on images that are pre-sized for social sharing. $9/month. 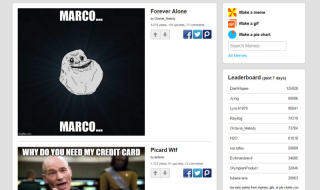 ImgFlip is a meme-creating tool that lets you customize font and text, and make GIFs from images or videos. Qzzr is an app for creating interactive quizzes for free (with basic customization) or $299/year for Pro-level options. 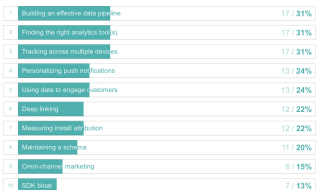 As a content marketer, you likely spend as much or more time promoting your content than creating it (or you should be). But with so many content marketers flooding the main arteries of social media, it’s getting harder to get your content noticed, which is why many of us have found much better results from sharing our visual content via these networks. 1.Pinterest — Some bloggers have cultivated followings of thousands just by using Pinterest, or a combo of Pinterest and Instagram (see The Dabblist). Sharing is free, but there is a science to which kinds of posts do best. They’re image-heavy, informative, and list-centric. 2. Instagram — Instagram is a powerful tool for visual content marketers, especially for sharing customer-centric photos (pictures about your customers), employee-centric photos (pictures about your employees or CEO) and contest photos. 3. Hipstamatic.com/oggl/ — If you use Hipstamatic’s photo effects to stylize your photos, you can share them on Hipstamatic’s community via their app. No one is as likely to appreciate your creative efforts as other creatives, and you might just up your game by getting ideas from your peers. 4. Dribbble.com — Describing itself for “show and tell for designers,” Dribbble is where you come to really strut your stuff, or get ideas from the best. Top designs get thousands of page views and hundreds of likes. 5. Behance.net — Another showcase site for creative work, Behance also allows you to get peer kudos in the form of thousands of views and hundreds of likes. You can submit your work to several categories, including Branding, Graphic Design, UI/UX and Web Design. 6. Tumblr — Incredibly sticky with a hip, young audience, Tumblr can be a great resource for marketing to millennials, especially if you’re marketing to a tight niche and have an amusing image. 7. Designerscouch.org — If your design skills are ready to turn pro (and freelance), you might want to check out Designers Couch. It’s like a collection of portfolios for designers, illustrators, web designers, and other visual creatives. 8. Slideshare — For B2B marketing, Slideshare is a happening place for sharing slides, infographics, and other informative visual materials. Don’t use it for blatant ads, but do use it for publishing exceptional original high-value content. 9. 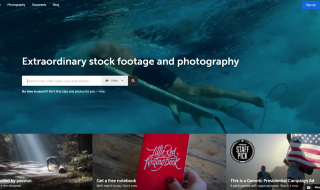 Vine — With channels like “DIY” and “Gaming,” and a young, tech-savvy demographic, Vine is practically made to foster viral videos. If you’re trying to reach younger millennials, this is where they are. Prepare to entertain them within 6 seconds. Each social media outlet has its own style and its own user demographic, but that just makes them better tools for finding and attracting your target market. But one characteristic rings true for all of them: These are users who love good humor, great visuals, and truly innovative creativity.